As we had expected, that original price of $299 we pulled from Verizon’s test site was only a set-up number and the real price according to new reports, has the Droid Pro set at $179 on new 2-year contract. And actually, if you were to buy it at full retail, it might only run you $479 and $349 on a 1-year extension. Not bad right? That’s pretty tempting, although I’m not sure how long I could handle a screen that small. 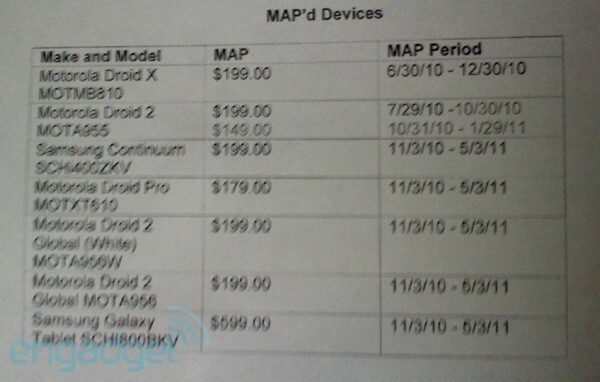 In related news, the Droid 2 Global (first pictures) will come in at $199 on 2-year contract which is pretty standard stuff. Again, it will come in 2 colors, have global roaming just like the Pro, and should replace the original D2 any day. And for some ridiculousness, we should point out that the Samsung Continuum pricing has been set at $199, which seems a little odd since the device only a 3.4″ screen. It does include a second screen called the “Ticker”, but why wouldn’t someone just go for the Fascinate and its 4inches of glory? Thoughts on the Pro and Global pricing?